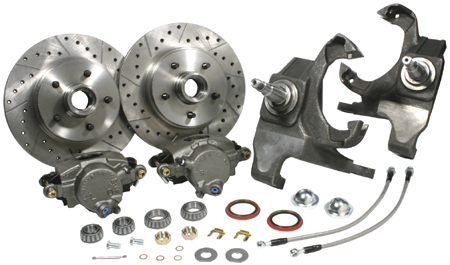 This new and revised kit has almost everything you need to add 12" disc brakes and 2" drop spindles to your disc or drum brake car, including NEW loaded (with disc pads) big piston calipers, 12" one-piece rotors, bearings, seals, dust caps, spindle nuts, hardware, and rubber brake hoses. Works with most 15" or larger disc brake wheels. Provides a full 2" drop and does not change the car's steering geometry. Shown with upgrades.